The stalwart warriors of the Terracotta Army have stood guard for more than 2,000 years, but I had doubts about the longevity of my small unit - a general, three soldiers and a horse. Costing $2 from a hawker selling them from a tatty plastic shopping bag, and bearing none of the hallmarks of the certified souvenirs being sold for 25 times more in the official shop, I wasn't sure if they'd survive the journey home in one piece, let alone live to tell the tale on my mantelpiece. But half the fun of shopping in China is the experience that goes with it, and the stories to tell afterwards. The 'label lust' of newly wealthy Chinese consumers and the country's booming economy means luxe lovers will be in their element. Our journey started in Shanghai at the swanky Portman Ritz-Carlton, with wall-to-wall designer shops in the surrounding streets, and ended at the Regent Beijing, next door to a Rolls Royce, Bentley and Ferrari showroom. But The Luxury Travel Bible loves a bargain as well, and the spectrum of China's retail therapy is as contrasting as its sights, making a visit completely unforgettable. The first night we headed to The Bund, Shanghai's sophisticated waterfront where Art Deco, Gothic and other historic buildings sit opposite modern skyscrapers, best seen at night for the dazzling neon signs. A great place to people watch, a small crowd gathered to look at giggling newlyweds posing for photos with a Union Flag suitcase. Surprisingly, for a big city, taxis are incredibly cheap and whilst the language can be a challenge outside the main hotels, shops and tourist attractions, the concierge gave us a useful 'please take me to' dual language tick list to hand the driver. Next day we took in the tranquil Yuyuan Garden in Shanghai's 16th century old town, a world away from the fast-paced modern centre. Imposing dragon-shaped walls guard the garden where ponds are filled with glistening koi carp and outside locals queue for their lunchtime fix of dim sum while older men unselfconsciously sit outside barber shops having their hair dyed glossy black. China's cities are undoubtedly amazing, but it's really when you venture further afield that you start to get immersed in the culture of this vast country that for many years was isolated from the rest of the world. The best way to take in the bucket list sights, and get around easily, is on a land-based tour combined with a cruise along the Yangtze, China's main waterway and the world's third largest river. After a short internal flight we reached Wuhan where a jolly red lion dancer welcomed us aboard Viking Emerald, our slow boat through China for the next five nights. The ship, which carries just over 250 passengers, is extremely comfortable with well-appointed modern cabins, a delightful ever-smiling crew and expansive restaurant serving Chinese and western cuisine. The Luxury Travel Bible particularly liked the glass of fizz that always greeted us at lunchtime (and the fact that unlimited wine, beer and soft drinks are included in the price with lunch and dinner). A top tip for passengers who really want to push out the proverbial boat is to book one of the two Explorer Suites, tucked away at the end of corridor and with huge private balconies. 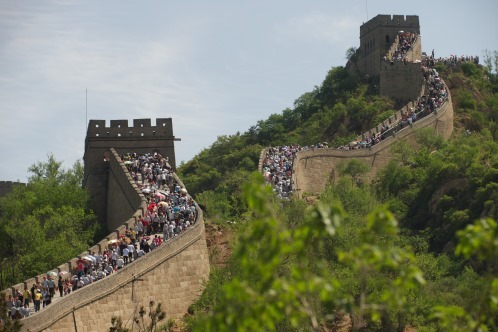 With all the main sightseeing tours also included, this is a hassle-free way to see China's 'wow factor' sights, plus things you'd never do if you were travelling under your own steam. One morning we visited a school sponsored by Viking, watching an enchanting song and dance performance before being surrounded in the classroom and given little mementos from the youngsters in exchange for autographs. The big hitters, such as walking along a section of the Great Wall, visiting the mighty Three Gorges Dam, Beijing's Tiananmen Square, adorable pandas at Chongqing Zoo and the overwhelming sight of the life-size Terra Cotta soldiers - which lay unseen before being unearthed by farmers in 1974 - are awesome and humbling. One night we took in a Chinese opera. The intricate jewel-coloured costumes are beautiful, but to western ears the music and singing can be pretty tortuous. Conversely, Chinese acrobatics crosses the cultural divide so prepare to be amazed by the gravity defying feats of performers. Out tour took in jade, silk painting and carpet factories. They might sound like tourist traps, but the government-run outlets are an accepted part of the shopping scene where quality is guaranteed and visits include insightful talks. Items ranged from the covetable to the questionable. Seriously, where would you hang an enormous silk picture of Princess Diana? Everywhere we went our indefatigable guide Francis came too, sharing his vast knowledge and chuckling with us at mangled 'Chinglish' signs - 'the grass is smiling at you, please detour' - our inability to pace ourselves with the never-ending stream of dishes at mealtimes (helpful hint: it's not over until the water melon arrives) and the initial trauma of Chinese-style toilets. Needless to say, he knew where luxury five-star toilets - yes, they really are graded by the tourist board - could be found. Back on board there were interesting lectures, a resident tailor who ran up gorgeous silk numbers at a very reasonable price and a charming, petite but deceptively effective therapist where the pain elements of my traditional massage were rewarded with feeling absolutely great - albeit the next day. Most days invariably ended in the bar, variously listening or dancing to the musical duo depending on energy levels and swapping tales of our daily adventures before heading for bed, where chopsticks and delicate Chinese paper art left on the pillows made a notable and welcome change from a solitary chocolate. I am pleased to report that my warriors did make it back. Although I'm not so sure if things are still ticking along for a fellow passenger who bought several fake Rolex watches and was constantly ribbed and asked the time for the rest of trip. Whatever the outcome, the priceless memories of the trip will endure a lot longer than the cheap souvenirs.